Last month I had the opportunity to give several presentations at the Baltimore Family History Workshop. This in a FREE annual genealogy conference hosted by the local Family History Center at the Church of Jesus Christ of Latter-day Saints. You can't get a better deal than free in genealogy education. At this conference there were over 50 classes to choose from and over 25 presenters. There were over 350 genealogists gathered to learn how to research their ancestry and connect with others who share their passion. There are many Family History Centers that host annual conferences and provide this type of education to their patrons. Below is a list of some of the annual events that I am aware of, and check with your local Family History Center to see if there is a conference in your area. page. Scroll down to the bottom of that page to see the APG videos. Some of the presentations have the handouts available for download also. This presentation will look at the use of alternative media...how to take your recorded lecture, add your slides, edit out any extraneous material, and create a DVD or downloadable audio or video podcast that you can sell. These skills not only enhance the experience for the viewer but can also provide an additional revenue stream for genealogists. Have you heard about the strategy to develop and market your specialty, your niche? What is or will be your niche? Decisions, decisions, decisions. Often the niche finds you in a form of genealogical serendipity. This lecture covers ways to help determine your niche, craft it to your liking, and figure out ways to let others know about your area or areas of expertise. Evaluating your own expertise can be painful but fulfilling and will let you know where you need to focus your educational efforts. We will discuss techniques for utilizing colleagues and clients to help in the evaluation process. Where do you turn when your research subject left no will, never married, and had no children? Discover how turning over every dusty rock along an ancestral trail can produce effective research results for clients. Viewers will learn about obscure and elusive resources and how casting a wide net across the span of his acquaintances and his time in history revealed the bachelor's nineteenth-century story -- a life full of adventure, peril, scandal, and a murder or two. 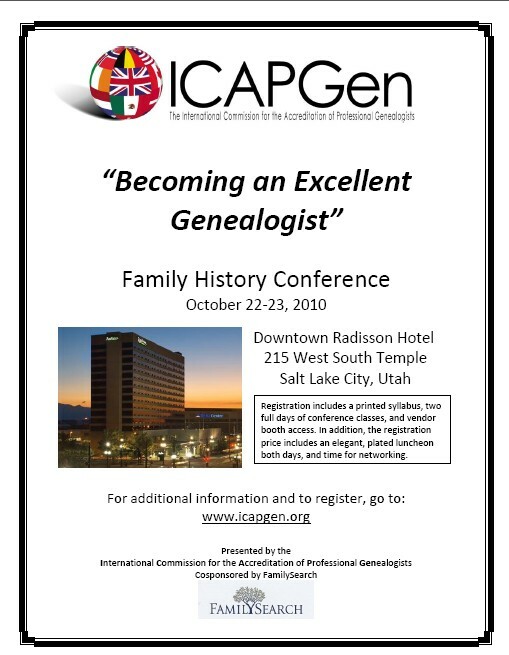 The International Commission for the Accreditation of Professional Genealogists (ICAPGEN) is holding a two-day Family History conference in Salt Lake City at the Downtown Radisson Hotel (215 West South Temple) on 22 and 23 October 2010. More information can be obtianed from the ICAPGEN website at http://www.icapgen.org/. 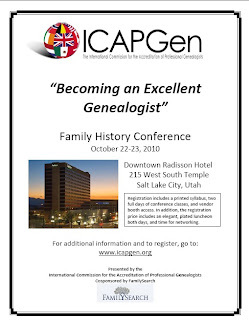 The Registration form is at http://www.icapgen.org/icapgen/catalog/icapgenconf2010. The Conference program is here. Registration includes two full days of conference classes, a printed syllabus, a plated luncheon both days, vendor booth access, and time for networking. The Family History Library is pleased to announce that the library will remain open until 11:00 p.m. on Friday, October 22, 2010, so that you can combine research time with conference attendance! Thanks to my friend Randy Seaver for sharing this announcement with me. The Salt Lake Institute of Genealogy (SLIG) is a week long institute with 11 tracks on various genealogy topics. The 2011 institute will be held January 10th to the 14th in Salt Lake City, Utah at the downtown Radisson Hotel. This location is only one block from the Family History Library, and there will be time after classes to research in the library. There is still room in 10 of the 11 tracks, and the early bird discount is in effect until October 30th. I attended the Salt Lake Institute of Genealogy in January of 2009 and thoroughly enjoyed the track on Professional Level Research. I will be returning to participate in the 2011 institute in the Advanced Methodology track. I have attended several genealogy institutes, and enjoy the focused education they provide. Some of the best genealogists in the country are going to be instructors in these courses. Here is the October / November webinar schedule from Ohana Software. These are all free programs, but require registration. To participate you will log in to GoTo Meeting and participate online. Come learn about what you can do to preserve your photographic heritage. We discuss how photos are formed, what we can do to take care of them and how to restore and enhance them digitally. Do you need gift ideas for the holidays? Become inspired to create unique calendars, cards, storybook pages, and more by attending this class. You will be guided through the process of producing personalized gifts for the holiday season and beyond, using Heritage Collector. There are so many new family history tools and web sites, it's easy to feel somewhat overwhelmed. Here's a colorful tour of much of the new stuff to make it easier, save you hundreds of hours, and have fun connecting to your ancestors. Learn about the best of the Internet, free websites, and unique resources. Join us and see what you're missing! If you are comfortable using FamilyInsight but want to better utilize its features, this class is for you. Learn how to link people or add other data while in Insight. Fix places that contain descriptive information, such as Bricklayer, instead of a place name. We will work with the Compare and Sync mode to update one file from another file without adding duplicates. I’ll even pass on a couple of trouble shooting tricks and tips. Join this class to take your use of FamilyInsight to the next level! Death Records 101: Find What Your Ancestors Left Behind: Learn what your ancestors’ deaths can tell you about their lives. This course teaches you how to use death certificates, wills, obituaries funeral home records and other related sources to further your research. Cemetery Research 101: Dig Up Your Family History:We'll get you excited about exploring your ancestors' final resting places and give you tips on how to read tombstones, decipher plot maps and keep your research organized. Discover Your Family Tree: Genealogy for the Absolute Beginner: This FREE two-week sampler course will start you on the fun and rewarding journey of discovering your roots.